It’s the end of National Hurricane Awareness Week, but it seems like the rain is just getting started. With rain and thunderstorms this weekend, we want to share some important information about basement waterproofing and how a sump pump can prevent flooding. But it isn’t just flooding that we should be worried about. Even a small amount of moisture in your home can cause structural problems, electrical fires, mold, and mildew. Sump pumps are an effective way to keep your basement dry, foundation strong, and your home free of health hazards like mold and mildew. 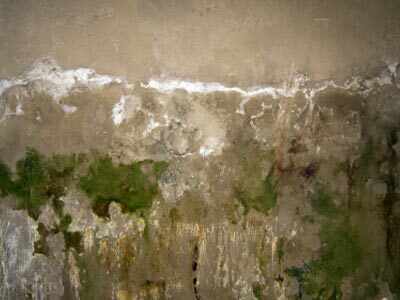 If you have a basement with wall that look like the picture below, you should definitely invest in a sump pump. Not only will this reduce very expensive repairs down the road, but it will instantly create better air quality in your home. Sump pumps are normally installed in a sump pit in the lowest part of your basement. It collects water through a drainage system in the soil. 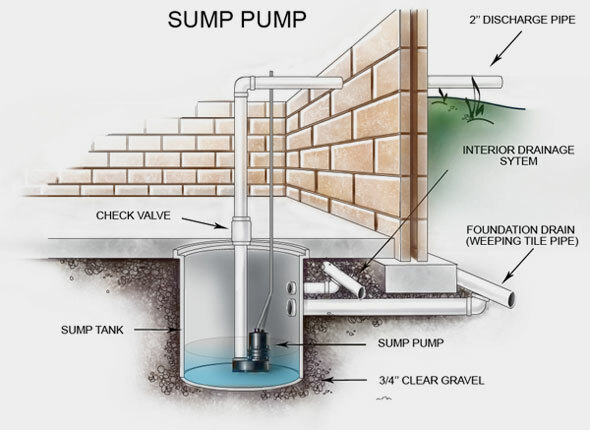 The sump pump gathers the water from the surrounding soil and pumps it far away from the home. submersible sump pump – this type of sump pump is displayed above. They sit at the bottom of the sump pump pit and have waterproof protective housing to avoid water damage. pedestal sump pump – as you may have guessed, these sump pump models sit on a pedestal, about at the top of the sump pump pit. This prevents the motor from getting wet. While pedestal models are cheaper and last longer, submersible units tend to have greater efficiency and are less susceptible to clogging. Both both types use a ball float to tell when to turn on or not. Once the ball float rises up to a certain level, the pump turns on and begins to pump water away from the home. As the water level recedes, the sump pump will turn off. You will also want to consider if you want a backup system for your sump pump in case of a power outage. Since sump pumps run on electricity, they won’t work during a power outage, when you might need it most. Even if it was just one flood, it could end up costing you all of your savings. As with many things, preventative maintenance is essential. If you could avoid $30,000 worth of damage with $1,000 in preventative care, wouldn’t you do it? It can be hard to find the right sump pump for your needs, but the highly trained technicians at Larry & Sons can help you determine the correct brand and model for your home. Larry & Sons sump pump installations, maintenance, and repairs are backed by a 100% Satisfaction Guarantee. If you ever have a problem with you sump pump, we will come back and make the necessary repairs. If you have a sump pump already, it is recommended that you schedule professional maintenance once a year to ensure the whole sump pump system is working properly. If you have a moldy or musty basement, have the professional at How a Sump Pump Prevents Basement Flooding install a sump pump system in your home. We will walk you through all of your sump pump options to choose the best solution for your needs. Call at 301-733-5428 for choosing, installing, repairing, and maintaining your sump pump. For over 65 years, we have been providing Hagerstown and the surrounding areas with quality plumbing services. Make us your first call! Check out our maintenance plan; we provide fall and spring HVAC tune-ups, 15 % off all repairs, and much more!